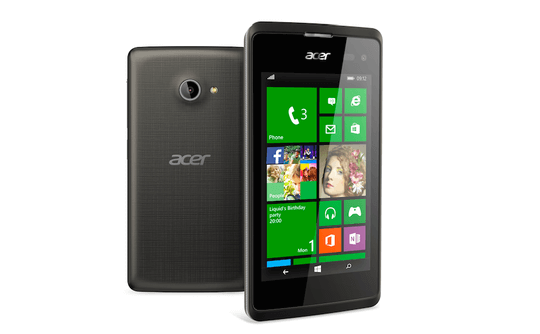 At Mobile World Congress today Acer announced their all new Windows Phone 8.1 device, the Acer Liquid M220. It represents Acer’s first Windows Phone 8.1 device and their first Windows Phone in four years but frankly, this is a huge disappointment. The specs of the Acer Liquid M220 are dismal and in fact do not even meet the minimum design guidelines for Windows Phone these days. In fact about the only positive I can see on this device is that it is Dual SIM. I would go as far as to say that if you are looking for a budget friendly Windows Phone, look at the Lumia 635. But hey, we have another vendor in the Windows Phone game, right? The specifications are pedestrian to say the very least and the 4GB of internal storage is a real head scratcher. I get it, they want to test the waters and that’s fine. The problem though is that the specs of the Acer Liquid M220 will not set it apart from an already very crowded budget end of the Windows Phone spectrum. Microsoft themselves have it pretty saturated with the Lumia 4xx, 5xx and 6xx lineup. The one positive note besides the Dual SIM support is that Acer has committed to bringing Windows 10 for Phones to this device. Price wise, the Acer Liquid M220 will be around $88 when and if it gets here. Again, take a look at the Lumia 635 which has better specs overall and is less expensive ($49 off contract from AT&T). I do hope that Acer has some success with this phone as having other vendors in the Windows Phone fray always helps. But I have the feeling they missed the mark.